Nestled in west-central Indiana, the city of Cloverdale has a population of 2,172. It hosts a single McDonalds, an Econo-Lodge and a beautiful natural attraction called Cataract Falls along Mill Creek. Cataract Falls is the largest waterfall in Indiana with a drop of over 80 feet cascading over a set of double waterfalls. The epitome of small town America, Cloverdale has a proud heritage going back nearly 150 years, and looks like a community right out of a Normal Rockwell painting. What? You’ve never heard of Cataract Falls? Well, that’s OK, as Cloverdale, Indiana boasts more than just a great mom-and-pop community feel and stunning examples of nature’s beauty. It is also home to another of America’s best kept secrets, pipe carver Wayne Teipen. 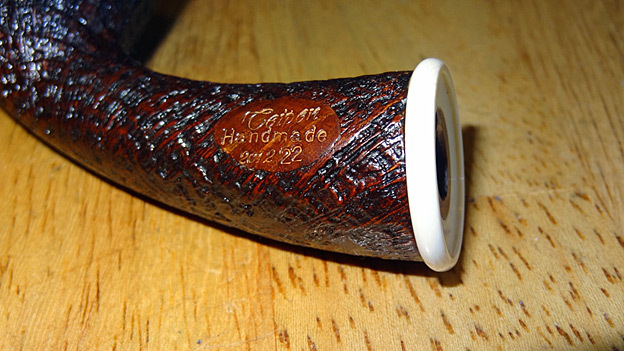 I first came to know of Wayne Teipen and his work last year as I was researching quality American pipe carvers. I did a brief spotlight on Wayne last June on my blog, and we have stayed in touch exchanging emails several times over the half year or so. Wayne’s focus, enthusiasm and desire to just be the best at what he does is just infectious, and it carried across all components of life for Wayne. Wayne is a registered nurse by trade, a skill that does not come without years of study and commitment. He has also been employed as a full time hospital administrator, another position that is not gained by being indifferent or apathetic. Everything that Wayne has involved himself in, he has done with commitment, drive, and pride—with a goal to excel. Wayne quickly agreed to the review, but based on his work schedule, family plans and other commitments he was not so sure when he might be able to get a pipe off to me. It just so happened he ended up with a few available before the end of the year, so here we are taking a look at this beautiful Teipen pipe. Arriving well packaged in bubble wrap, the pipe was stored in a beautiful dark royal blue velvet sock topped with a hand-tied satin bright silver braided rope pull-tie that looked elegant. The tie holes are capped with matching silver accent rings that keep the material from fraying, and give an additional appearance of grace to the packaging. The pipe fit well within the sock, and is ample for shipment and storage. 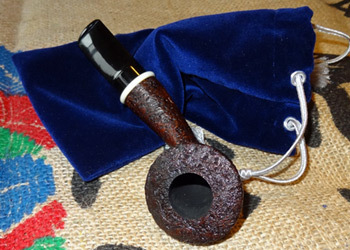 Few things are more frustrating to the buyer of a high-grade custom pipe then to find that the sock in which his investment was delivered was too small for the job. Investing several hundred dollars in a pipe and having to replace the sock right away is a real disappointment. Such was not the case here. I know spending too much time talking about a pipe sock might seem a bit of overkill. However, it is an important part of the buyer’s experience, and to pay too little attention to it as a pipe carver, is to be short sighted. Wayne’s care for the sock shows a desire to excel at all levels of this craft, and it will be appreciated by the consumer. Right out of the box I was struck by a few points. Aesthetically, it was instantly appealing. I loved this shape. A variation on a theme, Wayne calls this a ‘Free-Hand Dublin’, and the moniker is apropos. The stem was flat and exceptionally wide; wider than any I had ever seen before, and that caused me to wonder. The merging of the bowl to the shank was a center-point of focus for me, and the shank was capped with a beautiful white accent ring. 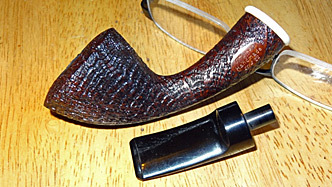 The bowl was thick at the rim, and the pipe overall seemed to have quite a bit of mass, but yet it was extremely light. It fit well in my hand, and simply begged to be held. The coloring, while not especially out of the ordinary, was beautiful. The pipe came with a certain ‘glow’ to it in both design and initial appeal. It gave off a very professional look, and would at first glance be put on the top shelf by any reputable smoking pipe reseller. In short, it made a fantastic first impression. If the confessed lack of experience is truly a practical one and not just humility coming through, then Wayne has an eye for briar like a seasoned pro who has been carving for decades. The blasting jobs I’ve seen on his pipes, and most especially the one on this Free-Hand Dublin are superb. The blast is harsh where it needs to be, gentle when gentle is called for, and blends its intensity seamlessly like a Cecil B. Demille film. This is an Oscar winning blast here. The flow of the grain is accentuated at the same time as the growth rings, without making it look like a squashed checker board, or a dirty fly-swatter. The effect of the blast is to give it an aggressive look, and at the same time a gentle feel to the pipe that still provides a firm purchase for the smoker. I like everything about it. The Free-Hand Dublin, in spite of its size is very light and comfortable as a smoker. It weighs in at 43.1 grams, and measures 5.75″ long with a 3/4″ tapered bowl. It has a rocker-bottom contour to it that adds to the mystique and class of the pipe. It seems to have a slight forward bend to it, but when looking closely at the engineering, it is rather an optical illusion. The geometry is fascinating. That curved underside moves your eyes forward towards the bowl area where the blast takes over, and with its stunning lines draw your eyes to move further upwards towards the top of the bowl like fine elfin fingers grasping the entire pipe from below. The bowl itself while seemingly slightly angled forward is not when looked at with the mind on linear detail. Just shy of being 2″ tall, the bowl thickens from the base upward, topping out with a fantastically dramatic rim that is a full half inch thick! 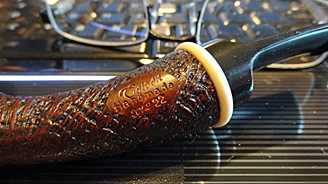 While thick rims so often mean physically heavier pipes, and a look that seems bulky, the Free-Hand Dublin is neither. And the blast on the rim is so attractive. Being slammed into the end of the grains of the briar block, the blasting created the look of a Thomas’ English Muffin with all the little nooks and crannies. It is delicious looking. At the base of the bowl transitioning to the shank is the centerpiece of this pipe. With the arched under-angle created in this Free-Hand Dublin, there is no definitive heel to the pipe. Because of that you have this nice even flow from the wide rim at the top of the bowl, narrowing as it morphs directly into the shank itself. The narrowest point of the pipe is at this transition point, and as the shank proceeds to the stem, it broadens once again to nearly a full inch in diameter. The narrow band between the opposing ends of the pipe create a wasp-waste look that reminds me of the old B58 Hustler bomber or the experimental XB-70 prototypes. This wasp-waste technology in the aeronautical field proved quite valuable in reducing drag coefficients, and transformed design standards in the fighter and supersonic airplane industry. I like it equally well in the pipe industry and in the case of this pipe, adds a flair that cannot be achieved any other way. The shank has an accent cap of pre-ban elephant ivory. It is as white as a spring daisy and having a dimension larger than the shank itself, is rounded off smoothly. This adds aesthetic value, provides a clean border break between the shank and the bit, and ensures that the smoker feels a smooth line down the entire length of the pipe. The stem is silky smooth and polished to a high lustrous finish. It is slightly bent, which for me allows the pipe to rest so comfortably on my chin while smoking. But that is not the feature that makes this pipe SO comfortable. Surprisingly, it is the width of the bit. When I first opened the package, this is one feature that caused me some pause. “Wow! That thing is wide”, ran through my mind. “It’s going to feel like smoking a wooden spoon!” I could not have been more wrong. This bit spreads what little tension this willowy pipe might put on your mouth across a wide area of lip or teeth. Distributing that weight across a greater surface area increases comfort level dramatically and in a very practical way. It’s so comfortable I find myself holding it in my mouth even when I’m not smoking. In part because it is just quite possibly the most comfortable pipe I have ever smoked, and secondly, because I want people to ask me about it! I want to tell people how much I like this pipe! It is a new experience for me, and one I like a great deal, so much so that I will look to incorporate more wide bit pipes into my collection. 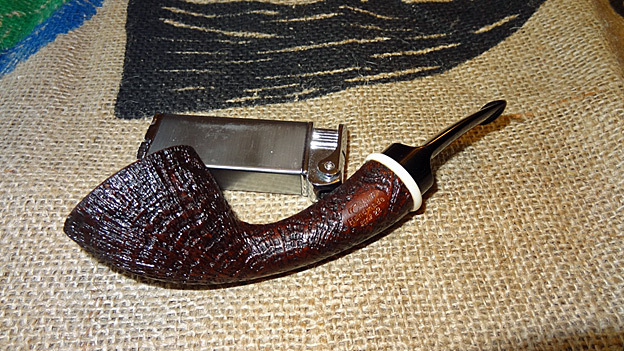 One question I like to ask the carvers about any particular pipe they send for review is about the briar block. 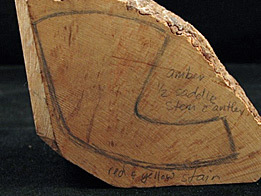 When the block was first selected, was it chosen to be the finished shape that it is, or did the briar declare to you along the way what it must be. In the case of Wayne Teipen, the briar wins out. Loud and clear seems to be right. I cannot imagine this briar having been finished any other way. This is a practical experience among artists that I see crosses genre of artistic talents. Paul Hewson, better known as Bono of U2 fame, once remarked in an interview for a video documentary of the recording of the Unforgettable Fire LP, “all songs are already written”, and went on to intimate that it was up to the artists to bring them to life. Michelangelo is perhaps best known for his Sistine Chapel work, but was noted by his contemporaries as the best sculptor of his time. He once pronounced that, “the sculpture is already inside the stone. I have to just remove the material that isn’t supposed to be there.” In that same vein of execution, Wayne took a block or briar that was already made in his mind, and brought it to life by simply removing the material that he knew was not supposed to be there. Not wanting to give away too much information on the subject of finish, Wayne did declare that he mixes all of his own stains from powder. Beginning last summer Wayne started coating all of his pipe’s bowls. Knowing that bowl coating is a polarizing topic when it comes to pipe carvers and collectors alike, Wayne confessed he was reticent to even begin coating his pipes. In the end, after weighing the pros and cons. His bowl coating decision served him well at least on this pipe. Filling the bowl with the fine contents of a previously unopened 12 year old tin of McClelland Bombay Court had me excited for a number of reasons. This pipe gives me everything I like in a pipe. 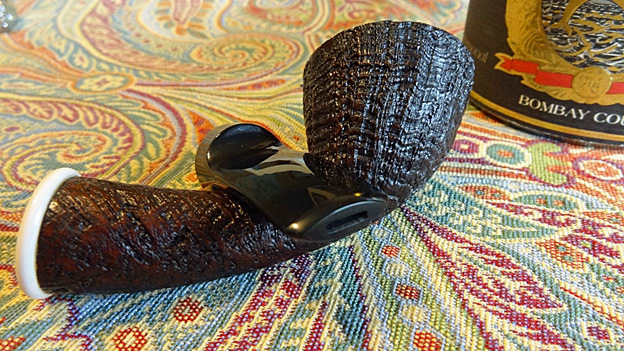 I like rusticated and blasted pipes. 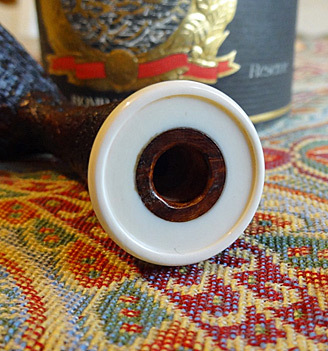 This pipe comes off showing an elegant style befitting the lifestyle of quiet sophistication. It is very light, bold, has lines that flow so smoothly from end to end, never being drawn to a point of visual departure, and it just plain fit my hand perfectly. In Las Vegas on a business trip at the time, I stepped outside of the Rio Hotel into the courtyard area; I chose a bench and planted myself. 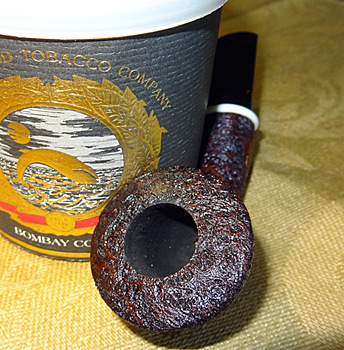 I had filled the bowl before I left the room and the tin aroma and immediate notes of a smoky Latakia came bursting out. The pungency of the Latakia was foremost, and not being a big smoker of these hardier blends I was curious to see what this was going to smoke like being so far out of my usual choices in tobacco blends. But when I fired it up, I was so glad to have stepped out of my comfort zone. The Teipen had a smooth draw and was ever so comfortable. While I did eventually feel the bowl warm from the fire within, it never got hot, and the smoke stayed cool the entire time. And the flavor! I know the flavor experienced might be 90% the choice of tobacco, but I’m equally confident that this wide duck-bill sized stem had a large part in the way I was enjoying this smoke. That stem flattens the smoke, spreads it out, cools it, and laid soft flavors over my tongue and roof of my mouth that gave me a pleasure in pipe smoking that I had hitherto not experienced. It was such a joy to smoke- I just sat there and soaked it up. The passersby must have thought me daft, or perhaps a few cards short of a deck I can presume (and perhaps rightly so), because I just sat there talking to myself, mumbling under my breath with a smile from ear to ear. I cherished that bowl for the better part of 25 minutes and was angry with myself for not bring more tobaccos with me. Even when the smoke was over, I just sat there giggling, making notes on my iPad, and making a spiritual note to myself about how glad I was to have met Wayne Teipen. I have smoked a lot of pipes over my time in collecting and smoking. I have smoked pipes from all over the world, some of lesser resale value, and some priced far beyond what we see for the average price on Teipen pipes. While there are a few pipes of the hundreds that I own that I might say I like a little more (some for sentimental reasons, some for aesthetic reasons, and maybe for no reason at all), but can I’ll tell you this; I cannot remember having a single more pleasurable smoking experience with a new pipe, EVER. I had to work to get the smile off my face! I love this little gem of a pipe, and want to thank Wayne Teipen for giving me such an opportunity to review a piece of his work. Having done so, I can recommend his pipes with full confidence that every buyer will be satisfied. I also know this to be true because Wayne guarantees such an experience on his web site as well. I’m confident that Teipen will become a ‘Titan’ in this industry.